How are food portions estimated? 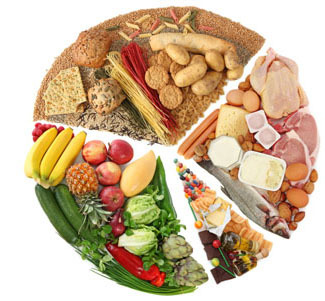 How to measure the portions of each of the main six type of foods is a commonly asked question. Below, the daily portions of the main six food types and estimation method are introduced. One portion= one bowl of white rice (or brown) = 2 bowls of noodles = 2 bowls of rice gruel = 2 bowls of oatmeal porridge = half a large slice of toast = around one slice of breakfast shop decrusted bread =three soup spoons of oats = 2 small sweet potato (or potato). Also, eat one portion of high fiber whole grain such as brown rice or 5-grain rice a day at least. Cooked vegetables portions can be measured in a bowl or on a small plate;one bowl or half a plate is one portion; one bowl packed full of uncooked Chinese lettuce is one portion. For vegetables that shrink a lot during cooking, such as sweet potato leaves, half a bowl of cooked vegetable is one portion. For vegetables that don’t shrink much when cooking, such as Chinese kale or broccoli, one portion is two thirds of a bowl after cooking. You should eat a variety of vegetables as part of your three meals a day (frequently change the color). Large fruit can be cut into small pieces and the portion measured in a bowl; a bowl (about palm size) of watermelon is one portion; 10 cherry tomatoes is one portion, an orange the size of a fist is one portion, 1.5-2 pieces of kiwifruit, date or passion fruit is one portion. Fresh fruit should be mainly eaten and should change with the season. Don’t drink fruit juice in place of fresh fruit because the fiber and some of the nutrients are lost when juice is squeezed and juice is usually high calorie. Cooked meat equal to the area of three fingers or half a palm is one portion 1 portion = fish 35g, clams 50g = skinless chicken breast 30g = duck, pork loin, lamb, beef shank 35g = one egg = soy beans (or black beans) 20g = green soy bean 50g = sugarless soy milk = half a box of soft tofu = three squares of traditional tofu. Avoid processed meats such as ham, hot dogs, sausages which often have high sodium and fat content. One 250 ml cup (or 240ml box of milk) is one portion. We suggest that full fat milk is seldom chosen and you mainly choose low fat or fat-free milk to avoid cardiovascular or obesity problems. A teaspoon of oil, around 5g, is one portion, 7 g of melon seeds, pistachios, walnuts, or almonds is one potion; 8g of pumpkin seeds, sunflower seeds, peanuts, cashew nuts or black (white) sesame seeds is one portion As for high cholesterol foods such as innards, chicken hearts, egg yolk, fish roe and prawn heads, even if your weight in in the normal range, you should pay attention to how much of these you and the daily cooking method should follow the low oil, low salt, low sugar principle. VICTOR reminds everyone that health needs to be accumulated day by day and managed over the long-term. We need to not just pay attention to whether our daily diet is balanced and that we eat a suitable amount, we should also develop the habit of doing regular exercise. So, go and find some like-minded people and arrange to play badminton at set times and enjoy working up a sweat and having fun interacting with people.